Connie Curtis Crayton (b 18 December 1914, Rockdale, Texas ? d 25 June 1985, Los Angeles), known as Pee Wee Crayton, was an American R&B guitarist and singer. Crayton began playing guitar seriously after moving to California in the mid-1930s, and settling in San Francisco. While there he absorbed the music of T-Bone Walker, but developed his own unique approach. His aggressive playing contrasted with his smooth vocal style, and was copied by many later blues guitarists. 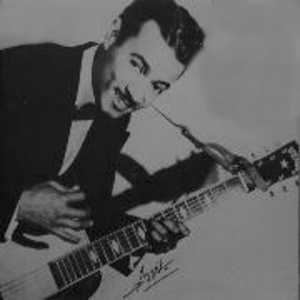 Crayton began playing guitar seriously after moving to California in the mid-1930s, and settling in San Francisco. While there he absorbed the music of T-Bone Walker, but developed his own unique approach. His aggressive playing contrasted with his smooth vocal style, and was copied by many later blues guitarists. In 1948 he signed a recording contract with Modern Records. One of his first recordings was the instrumental ?Blues After Hours?, which reached # 1 in the R&B charts late that year, and was followed up by equally imaginative recordings such as ?Texas Hop? and ?Poppa Stoppa?. He went on to record for many other labels in the 1950s including Imperial in New Orleans, and Vee-Jay in Chicago. It is thought he was the first blues guitarist to use a Fender Stratocaster, given to him by Leo Fender. However, further commercial success eluded him until a modest comeback in the 1970s.